But as they are here longer, their health advantage erodes. After five years or more in the U.S., they are 1.5 times more likely to have high blood pressure – and be obese – than when they arrived. Within one generation, their health is as poor as other Americans of similar income status. In Kennett Square, Pennsylvania, about 40 miles south of Philadelphia, Mexican immigrants like Amador Bernal now make up a quarter of the town's population. After almost 25 years in the U.S., Amador has never been to a doctor. And he's not alone. Some researchers believe that most immigrants come to the U.S. with a health advantage, even if their native country is poor. That's because people who are able to move to another country must be in good physical and mental health to begin with. Many researchers believe another factor is also at work. 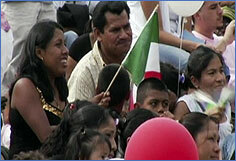 "Immigrants bring to this country aspects of culture, of tradition, of tight family social networks and community social networks that essentially form a shield around them and allow them to withstand the deleterious, negative impacts of American culture," says Alameda County (CA) Public Health Director Tony Iton, MD. But that shield has an expiration date. As Dr. William Vega's research with Mexican immigrants in California shows: "The levels of all major mental disorders increased when we looked at people who had been in the country over 13 years. So you see these protective factors begin to wear down." One reason is that low wages, working conditions and increased social exclusion tend to break down those protective shields. Isolation is on the rise in the U.S., not just among immigrants. One in four of us say they have no one they can talk to about their problems. And isolation kills.